About | Grow Your Own Veg Blog. Gardening and Food Blog. Fusian Living is a UK food and gardening blog based in the Chilterns, Buckinghamshire. Jo Jo Yee was born in Malaysia but spent most of her life in Sydney, Australia. 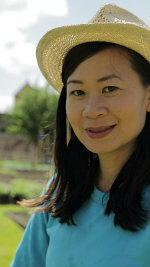 She moved to the United Kingdom in Feb 2011 and lives with her husband in Buckinghamshire. In 2015, Jo Jo was a contestant and finalist in The Big Allotment Challenge which aired on BBC2. Jo Jo has also written for Kitchen Garden magazine and currently has a monthly column 'Gardening tips for Green-fingered gourmets' in luxury cuisine and travel magazine, Good Things. Hi, I'm Jo Jo from the Big Allotment Challenge which aired on BBC2 earlier this year and is currently airing in Australia on the Lifestyle channel. I hope you enjoyed the series - this is my personal blog where you can join me on my journey in food and gardening. If you would like to get in touch, please email jojo@fusianliving.com. You can also follow me on Twitter or follow Fusian Living on Facebook.